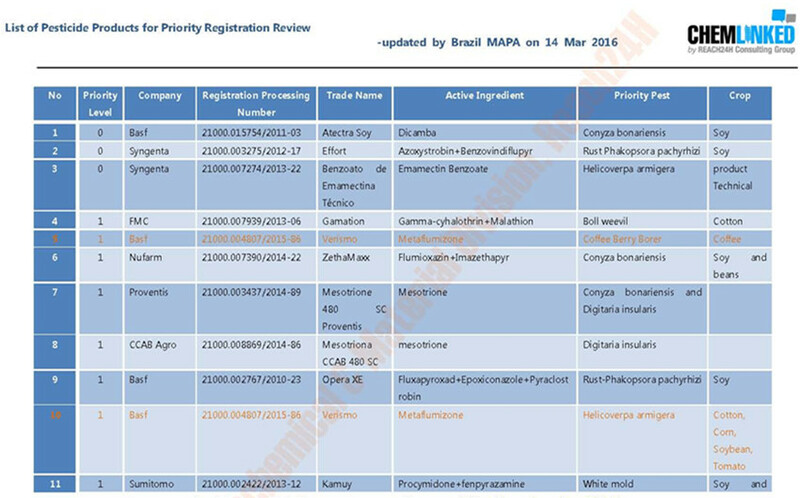 On 14th Mar 2016, the Brazil Ministry of Agriculture, Livestock and Supply (MAPA) updates the “ List of Pesticide Products for Priority Registration Review”, which includes the trade name, applicant and composition, proposed crop and pest of totally 68 pesticide products. MAPA pointed out that two pesticides based on new active ingredient were given considerable preference: BASF’s metaflumizone intended for control of two priority pests and ADAMA’s fluensulfone is the unique product for nematodes (pratylenchus brachyurus). In the next release of the product priority list, products based on these active ingredients with the same usage will be considered to have the same technological novelty and the final priority level will be determined by chronological order of the submission. For Full Content of the Priority List, click on the picture to download.